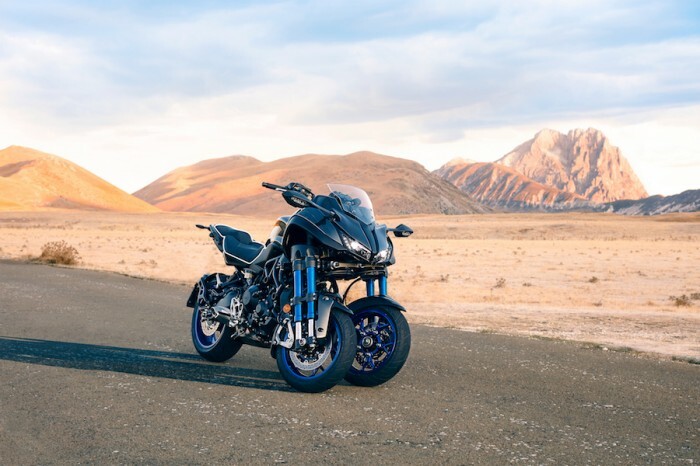 We mentioned the tuning fork firm’s MT-09 SP the other day, but Yamaha had a few other new items on show, all based round the MT-09 and MT-07 platforms. 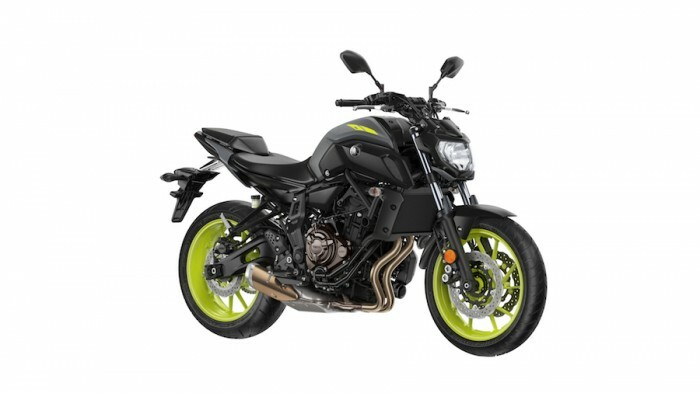 Most radical is obviously the three-wheeled ‘NIKEN’ (Japanese for ‘two swords’ supposedly), which is a leaning reverse trike thingy, using the back half of an MT-09 with a wild front end. It has two 15” wheels, four USD fork legs, and a crazy linkage that tilts the forks as you lean into a corner. There’s no locking function on the linkage, as on the various three-wheeled scooters you might have seen or tried before: if you walk away from the Niken, it will apparently fall over, just like a motorbike. Hmmm. It’s not much wider than many faired bikes, but there is (obviously) quite a big weight penalty. The wet weight, ready to ride, is a beefy 263kg, which is nearly 50kg more than the MT-09SP. 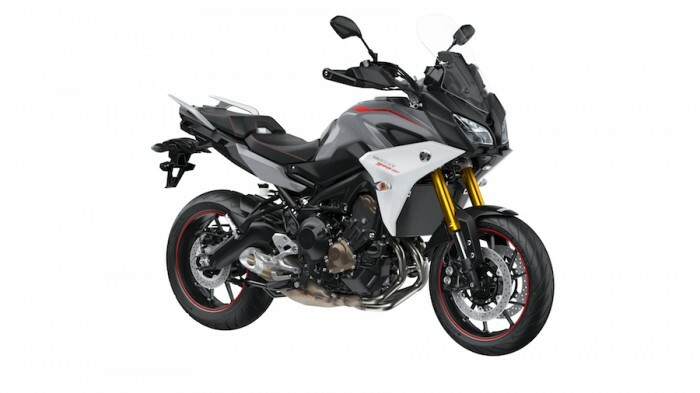 So, imagine the MT-09, with a 14-year-old boy sitting on the handlebars, and that’s the ballpark (the Niken won’t be constantly sulking on its phone though we imagine). The engine has, apparently, been completely revised, with new crank, pistons, heads, cams, all that stuff, in order to totally retune the power output. Peak claimed BHP is decent: 115bhp, and we guess the 850cc triple will still be a grunty beastie. All the big Yamaha bods were very keen to tell us how it’s a different thing, an amazing new take on control, fabulously beguiling, and all that. Even (Yamaha sub-contractor) Valentino Rossi came out on stage and told us how good it was, with amazing front end feedback from the twin 15” hoops. We smiled and nodded, but it will take a decent rideout on the new Niken, plus some time living with one, before we’ll be prepared to take the corporate spin totally on board. Yamaha’s been coming out with some cracking stuff of late – but we’ll need to wait and see if this is another hit from them. On the Tracer 900 front, we get another medium-level update on the excellent fun adventure tourer thingy. The changes are mostly cosmetic, with new bodywork, mudguard, pillion grab rails, as well as tweaks to riding position, and a new one-hand adjustable windscreen. There’s also a new ‘GT’ version, which bumps up the spec to a premium level: there’s a colour LCD screen, standard hard luggage, cruise control, quickshifter, and higher-spec, adjustable suspension. You also get heated grips: ace.